The brightly patterned Green-winged Teal is the smallest dabbling duck* in North America. It prefers shallow ponds with lots of emergent vegetation, and can be found in both fresh and saltwater habitats. Green-winged Teal breed from western Alaska across Canada southward to the northern Great Plains and Great Lakes region. It winters across the southern half of the United States southward to southern Mexico. In Tennessee, it is a fairly common migrant and winter resident across the state. Description: The breeding male is boldly patterned with a chestnut head and green ear patch. He has a speckled chest, and gray body with a vertical white bar on the side. The female is mottled brown with a white belly. In flight, both sexes show an iridescent green patch in the wing. Voice: Females give a shrill, weak quack. Courting males give a shrill whistle.. The male Green-winged Teal is distinctive. The female Blue-winged Teal is more grayish-brown with a dark belly, has white near the base of the bill, and has a large blue wing-patch, visible in flight. Habitat: In Tennessee, they are found in shallow pools, lakes, and on mud flats. Diet: Insect larvae, and seeds of grasses and sedges. 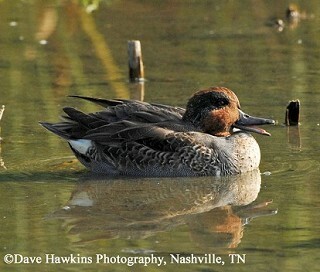 Status in Tennessee: The Green-winged Teal is a fairly common migrant and winter resident in the state. They arrive in mid-August and become less numerous during the winter. Spring migrants arrive in March and most birds depart by late April. Populations appear to be stable or even increasing. On its wintering grounds this species often congregates in large flocks and will move from region to region to find open water. The oldest known Green-winged Teal in the wild was 20 years, 3 months old. Best places to see in Tennessee: Most abundant in December and January and found at most state and federal waterfowl refuges across Tennessee. Johnson, K. 1995. Green-winged Teal (Anas crecca). The Birds of North America, No. 193 (A. Poole and F. Gill, eds.). The Academy of Natural Sciences, Philadelphia, and The American Ornithologists' Union, Washington, D.C.
* Dabbling ducks feed by tipping tail-up to reach aquatic plants, seeds, and snails. They seldom dive below the water.